Parenthood. What a roller-coaster ride. 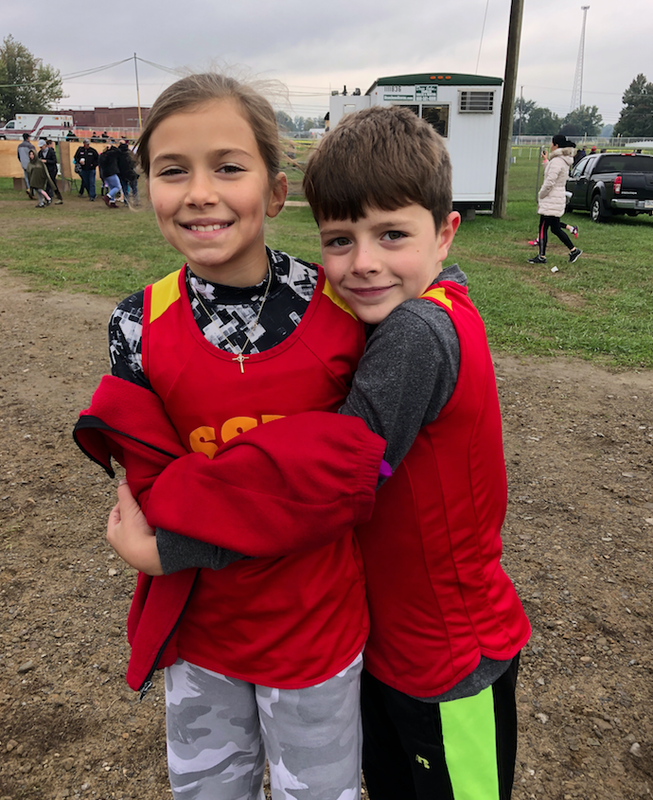 Saturday our kids competed against other Catholic schools in the Pittsburgh Diocesan Championship at the Lawrence County Fairgrounds. We had high hopes for The Animal, who as a 3rd-grader has shown great promise, regularly beating runners 2 or 3 grades older. Honestly, I just wanted him to try his best. But I knew, just like his daddy, he wanted to win. We can’t help it. Competitiveness is just something that runs through our blood. As the starter’s horn blasted and 130 boys took off across the field on that cool, damp autumn morning, my boy started off strong, maybe too strong. After he ran out of sight, I sprinted across the field to wait for him at the halfway point and urge him on. But as I saw him turn the corner, I knew something was wrong. In every race he’s run thus far, the kid’s never changed his expression. From start to finish, he always wears his poker face, usually finishing like he just got back from a leisurely stroll around the block. But as he came down the back stretch with a mile to go, I could see that he was crying. Sobbing, actually. I wasn’t sure what was wrong — maybe he had a cramp? — but it killed me to see him that way as he continued on down the path. The next time I saw him, with about a quarter of a mile left in the race, he was much more composed and, thankfully, no longer crying. He ended up finishing the race with an impressive sprint, not fast enough for a medal, but fast enough to make us incredibly proud. Apparently he was upset that he couldn’t catch the other, faster boys in the race. And every runner that passed him made him all the more disappointed. As a runner myself, I can say been there, felt that. Running is both physical and mental. Jump to today for my daughter’s U-14 soccer match. Again, Boogieface is just 11 years old. This is her first time playing on a “big girls'” team, and she’s one of the smallest, greenest players on the squad. Understandably, she’s been a little tentative on the field this season, seeing that many of her teammates are literally twice her size. We know she has talent, however, and we’ve been hoping something would happen that would give her that boost of confidence she’s been oh-so needing. She only played a few minutes in the first half. But late in the second half, her coach had her playing up on offense at right wing. Her team had been knocking at the door and were looking to get a little cushion on their 1-0 lead. Suddenly the center forward got possession of the ball inside the box, and seeing that her path was blocked by a defender, looked to pass the ball to another player. From my chilly, metal seat in the bleachers, I witnessed this all happening in slow motion. Boogs was wide open. The ball was bouncing as it came to her. She always passes the ball to someone else in this situation. This time she watched the ball all the way to her foot, and without hesitating, kicked it right over top of the goalie and into the back of the net. It almost makes me cry just writing about it. Needless to say, I jumped up from my seat and yelled at the top of my lungs, catching my daughter’s attention and most likely scaring the 30 or so other parents in attendance. But I didn’t care. This was a huge moment for my little girl. Her first-ever goal with this upper-level team. This was big. Something that will help her confidence and catch the eye of her coaches who will most certainly have more faith in her going forward. So that was my weekend. Really big highs and really big lows, but most of all, incredible pride in my kids and their courage to persevere despite the odds. It was one of the greatest weekends of my life. One Response to "October Mindfulness Challenge – Day 21 – A Weekend to Remember"
As a parent and grandparent I know the emotions of what you felt with your children at the track and soccer game.